Daffodils and doves . . . but no fireworks | A balanced diet . . . Yesterday (18 April) was, in many parts of the UK, the warmest day since the end of August 2017. After the lingering cold and grey weather we have had to endure in recent weeks, the prospect of a bright, sunny day certainly was encouraging. And, not being ones to squander an opportunity to be out and about when possible, we made the short trip to Coughton Court, a National Trust property on the outskirts of Alcester in Warwickshire, just 12 miles from home. Coughton Court is one of our ‘local’ National Trust visits, and we’ve been there on several occasions mostly to walk through the bluebell wood and gardens. It has been in the same Throckmorton family for over 600 years, and the family still has apartments there. We were too early to see a carpet of bluebells in the ancient wood to the east of the house. But we were not totally disappointed and some had already begun to bloom. The Daffodil Society is holding its 2018 show at Coughton this weekend that we would have liked to attend, but have other plans made. So our visit yesterday was to view the extensive planting of daffodils in the grounds of Coughton Court. We were concerned that they would be past their best, but because of the dreary weather (and access issues at Coughton due to waterlogged car-parking) just hadn’t been able to schedule our visit before now. Yes, some daffodil varieties were past their best, but there were still plenty more to lift our spirits. In the orchard, there was a carpet of purple and white fritillaries under the apple trees (just about to come into flower) mixed with primroses and grape hyacinths. Afterwards, we headed a further two miles southeast to view Kinwarton Dovecote¹ that stands alone in the middle of a field. Built in the 14th century (probably during the reign of King Edward III), the circular dovecote has more than 500 nesting niches, from which young pigeons or squabs would be taken for their meat. It has walls that are about three feet thick, and it rises at least 20 feet to the top of the nesting ledges. A ‘potence’ or pivoted ladder (in need of repair) provided access to the highest niches. What an impressive structure that has stood proudly in the Warwickshire landscape for six centuries. What stories it could tell. But what about the reference I made in the title of this blog post to ‘fireworks’. Well, the Throckmorton family of Coughton Court were implicated in the 1605 Gunpowder Plot to overthrow recently crowned King James I (and VI of Scotland) by blowing up the Houses of Parliament. The plot, on 5 November, is celebrated each year by fireworks displays nationwide. 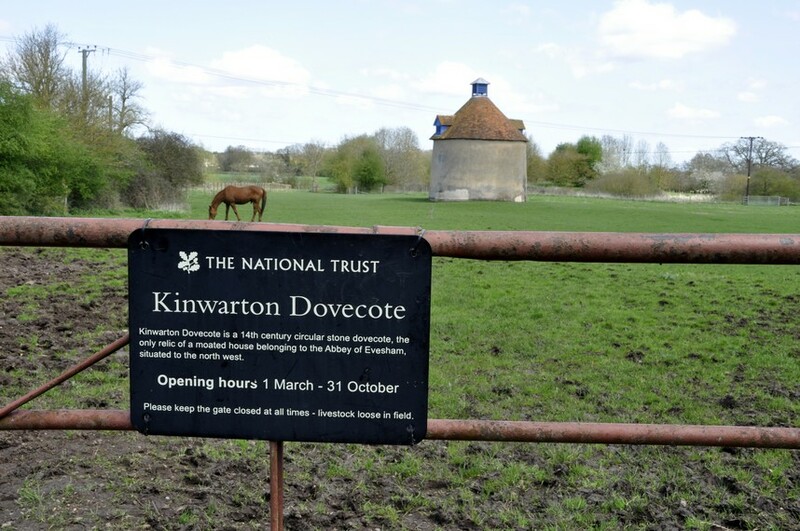 ¹ We have visited other dovecotes owned by the National Trust and you can read about them here. This entry was posted in Out and about and tagged Coughton Court, daffodils, dovecote, Kinwarton dovecote, National Trust.